A visitor is not long in Nottingham before he hears of the caves in the Castle Rock and elsewhere, and is taken to see them. Today they are merely curiosities, but in bygone years some of them were used as dwellings. 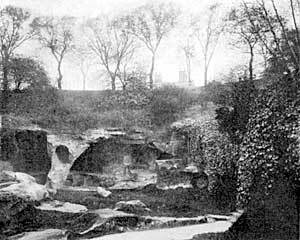 The earliest historic notice of Nottingham refers to the place under the British name Tigguocobauc, which means “the house of caves.” From this has arisen the erroneous impression that the present name also has the same meaning. With the City of Nottingham is associated a large extent of country known by the interchangeable names of Nottinghamshire and the County of Nottingham. These also reflect the influence of the Anglo-Saxons and Normans respectively. The suffix “shire” is akin to the word “share,” and like it signifies a division, something cut off. “County” only dates from Norman times and denotes the domain of a Comte or Count. There is no historical account of the coming into existence of Nottinghamshire. At one time the area it covers seems to have been divided between the kingdoms of Mercia and Lindsey. It certainly existed as a shire before 1016, for the word Snotingahamscire occurs in writings of that date. Probably it was created a century before by Edward the Elder. This king in order to consolidate the newly acquired portion of his kingdom, situated in the region now called the Midlands, placed “shares” of it under the control of chief men or Ealdormen. Usually each share or shire, as it was called, consisted of those portions of the country that were within easy reach of a military centre. Nottingham was such a centre, situated not far from the old Roman Fosseway, and at a point where an important road to the north crossed the Trent. It thus dominated the country through which these three ways passed. That country was naturally made into a shire administered from Nottingham and therefore called Nottinghamshire. On the other hand the shire may have been formed from the district which was settled by that Danish army which had its head-quarters in Nottingham. As has just been remarked, the expressions County of Nottingham and Nottinghamshire are used indifferently. But shire and county do not quite mean the same thing. Though we speak of all the divisions of England collectively as counties not all of them are strictly so—as for example the Duchy of Cornwall—nor is the suffix shire applied except to such divisions of our land as once formed part of the early English kingdoms. There are other counties, such as Kent, Essex, Suffolk, etc., which reveal their origin in their names—the kingdom of the Cantii, of the East Saxons, of the people south of the Little Ouse and Waveney—and these, it should be observed, have in most cases kept their boundaries unaltered to this day. As a rule, however, our counties are by no means fixed quantities, and their boundaries—even in spite of the fact that they are mainly dependent on the natural delimitation of river or range, and not as in America marked out with a ruler—have often altered. They are, in fact, altering now, and the county of London has come into existence within the recollection of all of us.